Heat exchangers are devices that are used to transfer thermal energy from one fluid to another without mixing the two fluids. The fluids are usually separated by a solid wall (with high thermal conductivity) to prevent mixing or they may be in direct contact. The classic example of a heat exchanger is found in an internal combustion engine in which an engine coolant flows through radiator coils and air flows past the coils, which cools the coolant and heats the incoming air. In power engineering, common applications of heat exchangers include steam generators, fan coolers, cooling water heat exchangers, and condensers. 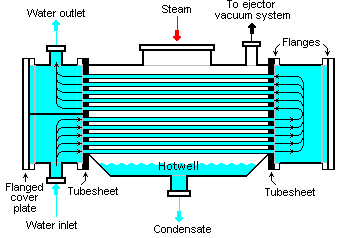 For example, steam generator is used to convert feedwater into steam from heat produced in a nuclear reactor core. The steam produced drives the turbine. Heat transfer in a heat exchanger usually involves convection in each fluid and thermal conduction through the wall separating the two fluids. 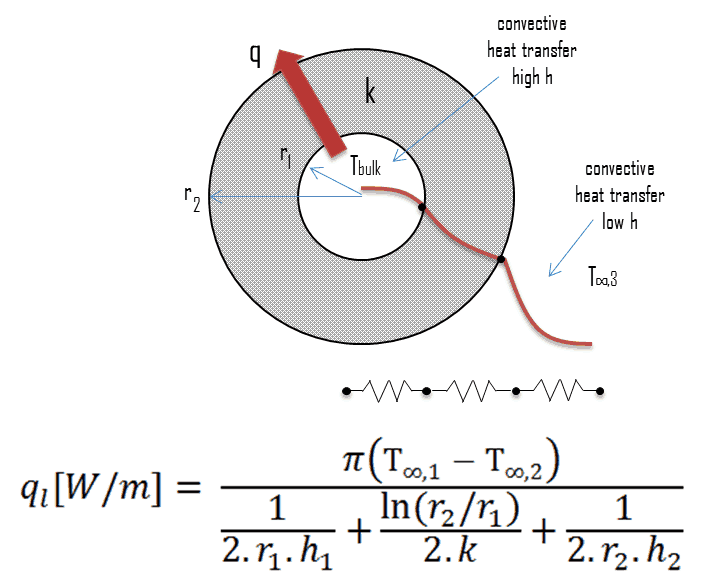 In the analysis of heat exchangers, it is often convenient to work with an overall heat transfer coefficient, known as a U-factor. The U-factor is defined by an expression analogous to Newton’s law of cooling. 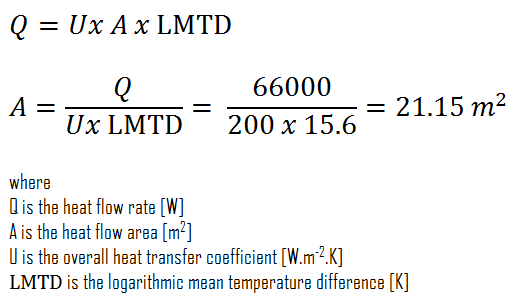 Moreover, engineers also use the logarithmic mean temperature difference (LMTD) to determine the temperature driving force for heat transfer in heat exchangers. Special Reference: John R. Thome, Engineering Data Book III. Wolverine Tube Inc. 2004. Heat exchangers are typically classified according to flow arrangement and type of construction. The simplest heat exchanger is one for which the hot and cold fluids move in the same or opposite directions. This heat exchanger consists of two concentric pipes of different diameters. parallel-flow arrangement. 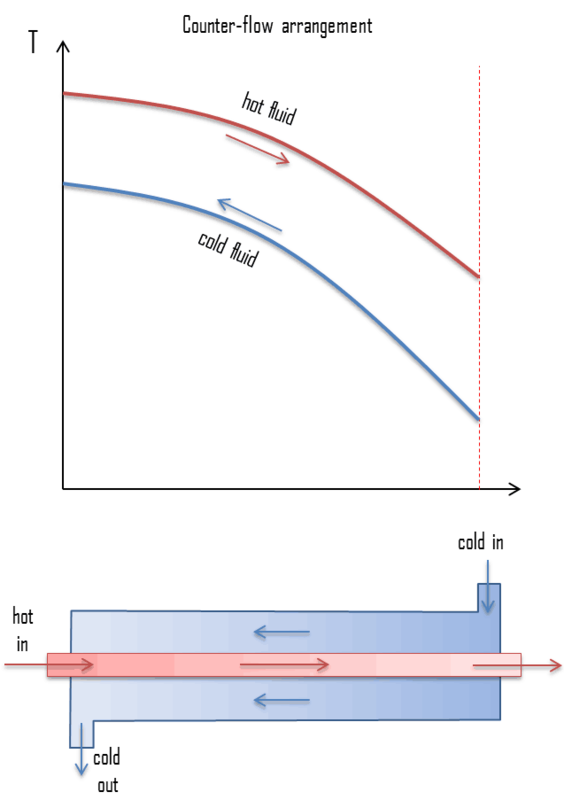 In the parallel-flow arrangement, the hot and cold fluids enter at the same end, flow in the same direction, and leave at the same end. counter-flow arrangement. In the counter-flow arrangement, the fluids enter at opposite ends, flow in opposite directions, and leave at opposite ends. Figure represents the directions of fluid flow in the parallel and counter-flow exchangers. Under comparable conditions, more heat is transferred in a counter-flow arrangement than in a parallel flow heat exchanger. 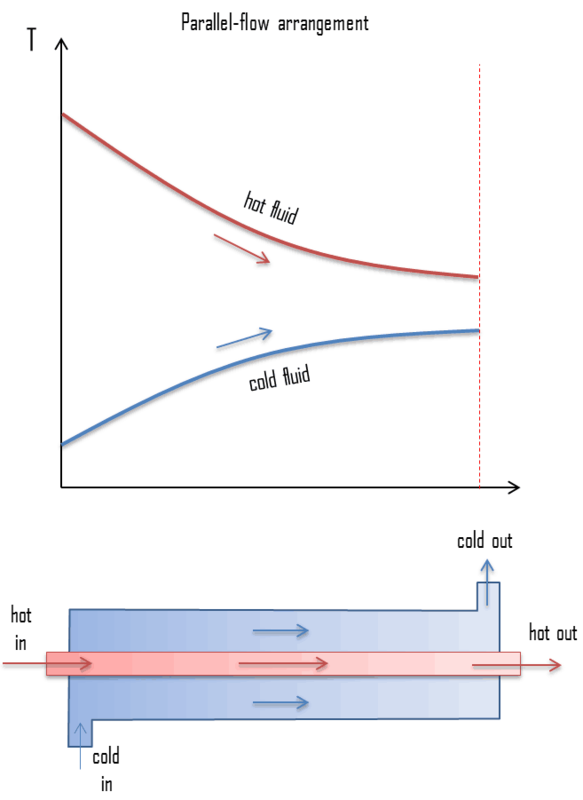 The temperature profiles of the two heat exchangers indicate two major disadvantages in the parallel-flow design. 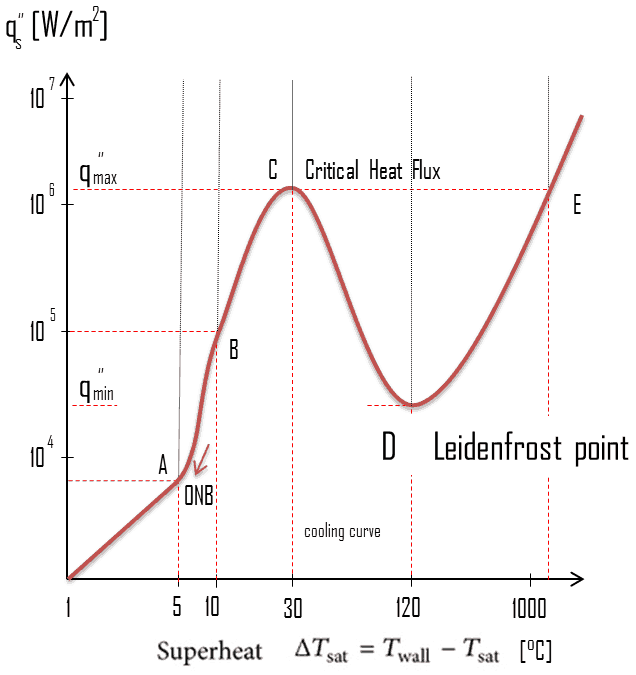 The large temperature difference at the ends causes large thermal stresses. 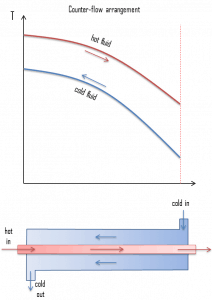 The temperature of the cold fluid exiting the heat exchanger never exceeds the lowest temperature of the hot fluid. The design of a parallel flow heat exchanger is advantageous when two fluids are required to be brought to nearly the same temperature. Double pipe heat exchangers. Double pipe heat exchangers are cheap for both design and maintenance, making them a good choice for small industries. In these exchangers one fluid flows inside the tube and the other fluid flows on the outside. Although they are simple and cheap, their low efficiency coupled with the high space occupied in large scales, has led modern industries to use more efficient heat exchangers like shell and tube. Shell and tube heat exchangers. Shell and tube heat exchangers in their various construction modifications are probably the most widespread and commonly used basic heat exchanger configuration in industry. Shell-and-tube heat exchangers are further classified according to the number of shell and tube passes involved. Shell and tube heat exchangers are typically used for high-pressure applications (with pressures greater than 30 bar and temperatures greater than 260 °C). This is because the shell and tube heat exchangers can withstand high pressures due to their shape. In this type of heat exchanger, a number of small bore pipes are fitted between two tube plates and primary fluid flows through these tubes. The tube bundle is placed inside a shell and the secondary fluid flows through the shell and over the surface of the tubes. 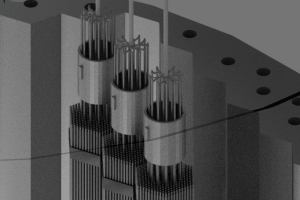 In nuclear engineering, this design of heat exchangers is widely used as in case of steam generator, which are used to convert feedwater into steam from heat produced in a nuclear reactor core. To increase the amount of heat transferred and the power generated, the heat exchange surface must be maximized. This is obtained by using tubes. Each steam generator can contain anywhere from 3,000 to 16,000 tubes, each about 19mm diameter. Plate heat exchangers. A plate heat exchanger is a type of heat exchanger that uses metal plates to transfer heat between two fluids. This arrangement is popular with heat exchangers using air or gas as well as lower velocity fluid flow. The classic example of a heat exchanger is found in an internal combustion engine in which an engine coolant flows through radiator coils and air flows past the coils, which cools the coolant and heats the incoming air. When compared to shell and tube exchangers, the stacked-plate arrangement typically has lower volume and cost. Another difference between the two is that plate exchangers typically serve low to medium pressure fluids, compared to medium and high pressures of shell and tube. Heat exchangers are commonly used in industry, and proper design of a heat exchanger depends on many variables. Following terms and methods are widely used to select an appropriate heat exchanger. A heat exchanger typically involves two flowing fluids separated by a solid wall. Many of the heat transfer processes encountered in industry involve composite systems and even involve a combination of both conduction and convection. 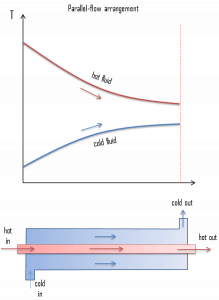 Heat is first transferred from the hot fluid to the wall by convection, through the wall by conduction, and from the wall to the cold fluid again by convection. 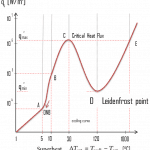 The overall heat transfer coefficient, U, is related to the total thermal resistance and depends on the geometry of the problem. 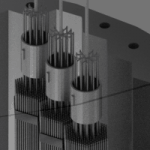 For example, heat transfer in a steam generator involves convection from the bulk of the reactor coolant to the steam generator inner tube surface, conduction through the tube wall, and convection (boiling) from the outer tube surface to the secondary side fluid. In cases of combined heat transfer for a heat exchanger, there are two values for h. There is the convective heat transfer coefficient (h) for the fluid film inside the tubes and a convective heat transfer coefficient for the fluid film outside the tubes. The thermal conductivity (k) and thickness (Δx) of the tube wall must also be accounted for. Steady heat transfer through multilayered cylindrical or spherical shells can be handled just like multilayered plane walls. Online monitoring of commercial heat exchangers is done by tracking the overall heat transfer coefficient, because the overall heat transfer coefficient tends to decline over time due to fouling. By periodically calculating the overall heat transfer coefficient from exchanger flow rates and temperatures, the operator of the heat exchanger can estimate the lifetime of heat exchangers. Online monitoring of commercial heat exchangers is done by tracking the overall heat transfer coefficient, because the overall heat transfer coefficient tends to decline over time due to fouling. Fouling is the accumulation of unwanted material on solid surfaces to the detriment of function. The fouling materials can consist of either living organisms or a non-living substance (minerals or organic compounds). The layer of deposits represents additional resistance to heat transfer and causes the rate of heat transfer in a heat exchanger to decrease. As a result, fouling in heat exchangers reduces thermal efficiency, decreases heat flux, increases temperature on the hot side, decreases temperature on the cold side, induces under-deposit corrosion, increases use of cooling water. 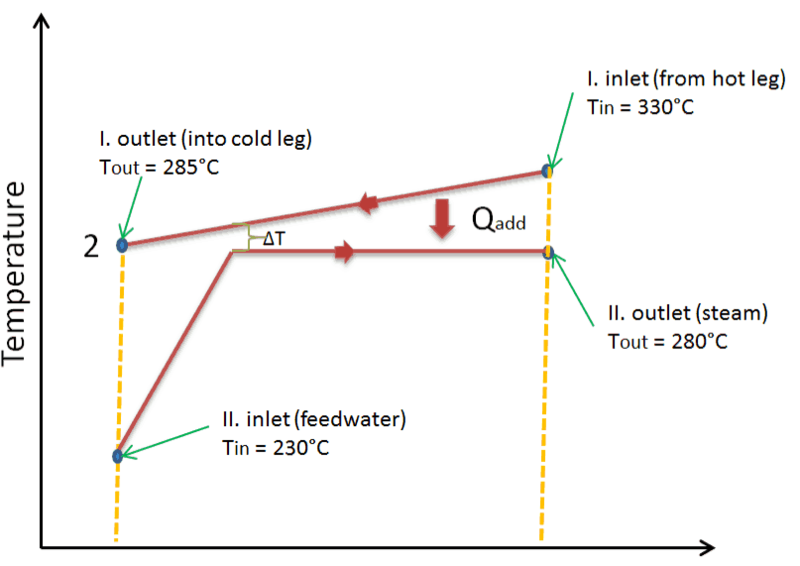 The net effect of these accumulations on heat transfer is represented by a fouling factor, Rf , which is a measure of the overall thermal resistance introduced by fouling. In order to solve certain heat exchanger problems, engineers often use a log mean temperature difference (LMTD), which is used to determine the temperature driving force for heat transfer in heat exchangers. 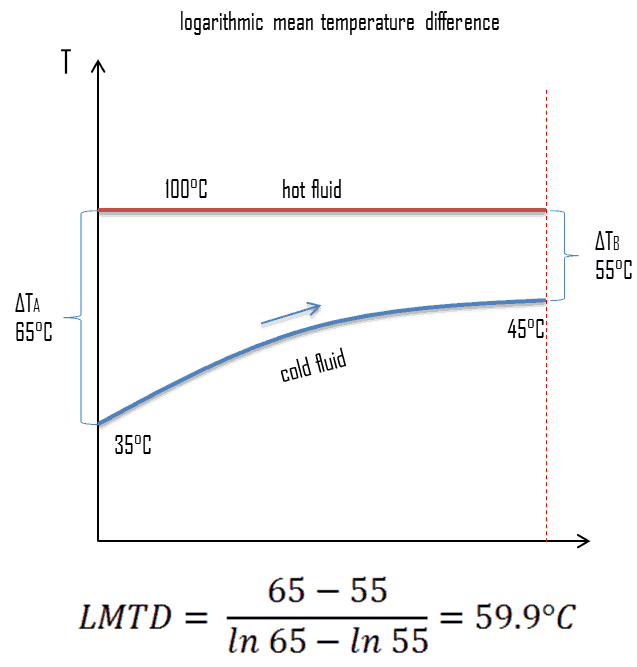 LMTD is introduced due to the fact, the temperature change that takes place across the heat exchanger from the entrance to the exit is not linear. Here the value of overall heat transfer coefficient can be assumed as a constant. On the other hand the temperature difference continuously varies with location (especially in counter-flow arrangement). In order to determine the total heat flow, either the heat flow should be summed up using elemental areas and the temperature difference at the location or more conveniently engineers can average the value of temperature difference. 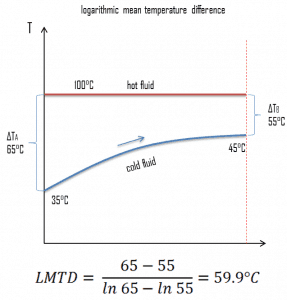 The heat exchanger equation can be solved much easier if we could define a “Mean Temperature Difference” (MTD). 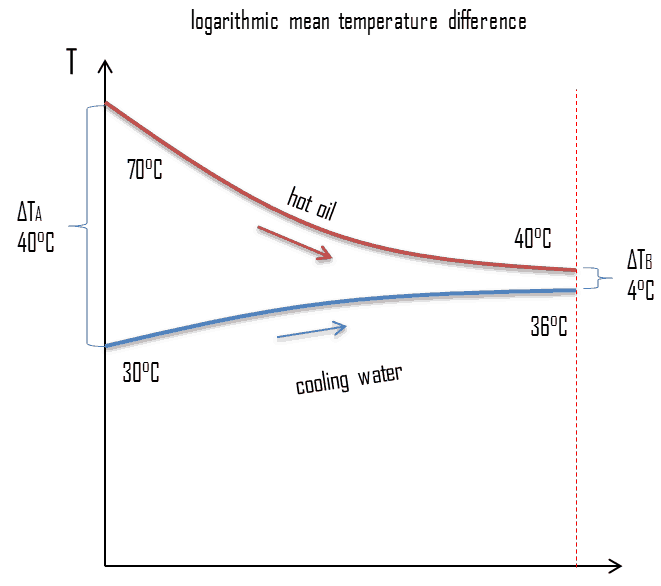 It can be seen from the figure that the temperature difference varies along the flow and the arithmetic average may not be the real average, therefore engineers use the logarithmic mean temperature difference. 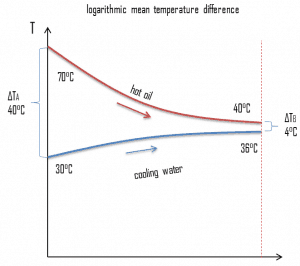 The “Logarithmic Mean Temperature Difference“ (LMTD) is a logarithmic average of the temperature difference between the hot and cold feeds at each end of the heat exchanger. The larger the LMTD, the more heat is transferred. It can be seen from the figure that the temperature difference varies along the flow and the arithmetic average may not be the real average. This holds both for parallel-flow arrangement, where the streams enter from the same end, and for counter-flow arrangement, where they enter from different ends. 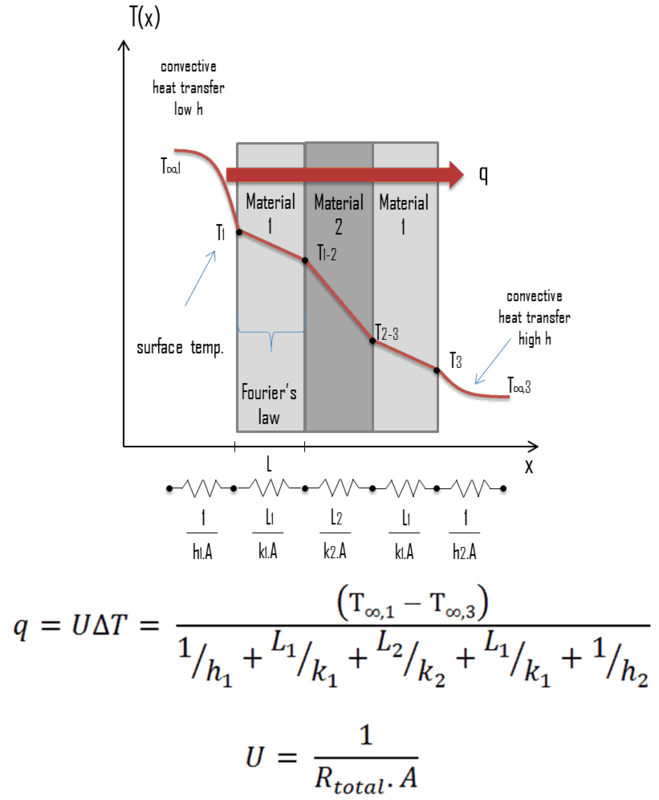 In a cross-flow, in which one system, usually the heat sink, has the same nominal temperature at all points on the heat transfer surface, a similar relation between exchanged heat and LMTD holds, but with a correction factor. A correction factor is also required for other more complex geometries, such as a shell and tube exchanger with baffles. 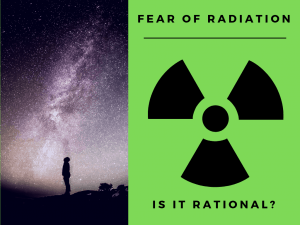 Steam generators and condensers are also examples of components found in nuclear facilities where the concept of LMTD is needed to address certain problems. When the subcooled water enters the steam generator, it must be heated up to its boiling point and then it must be evaporated. Because evaporation is taking place at constant temperature, it cannot be used a single LMTD. In this case the heat exchanger has to be treated as a combination of two or three (when superheat occurs) heat exchangers. There is another interesting aspect to the design in that the temperature difference known as ‘pinch’ can limit the performance of heat exchangers if the areas and flow rates are not properly designed. Pinch point is the location in heat exchanger where the temperature difference between hot and cold fluid is minimum at that location. 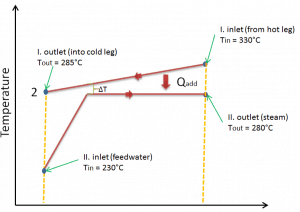 The log mean temperature difference (LMTD) method discussed in previous section is easy to use in heat exchanger analysis when the inlet and the outlet temperatures of the hot and cold fluids are known or can be determined from an energy balance. 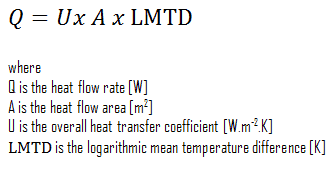 Therefore, the LMTD method is very suitable for determining the size and performance of a heat exchanger. As can be seen, the effectiveness is the ratio between the actual heat transfer rate and the maximum possible heat transfer rate. To define the effectiveness of a heat exchanger, we must first determine the maximum possible heat transfer rate, qmax, for the heat exchanger. Consider a parallel-flow heat exchanger, which is used to cool oil from 70°C to 40°C using water available at 30°C. The outlet temperature of the water is 36°C. The rate of flow of oil is 1 kg/s. 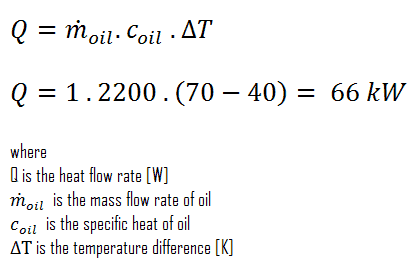 The specific heat of the oil is 2.2 kJ/kg K. The overall heat transfer coefficient U = 200 W/m2 K.
Calculate the logarithmic mean temperature difference. Determine the area of this heat exchanger required for this performance. To calculated the area of this heat exchanger, we have to calculate the heat flow rate using mass flow rate of oil and LMTD. Recuperator is a type of heat exchanger has separate flow paths for each fluid along their own passages and heat is transferred through the separating walls. 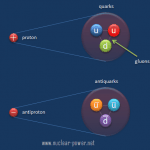 Recuperators (e.g. economisers) are often used in power engineering, to increase the overall efficiency of thermodynamic cycles. 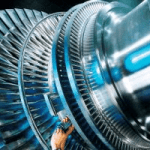 For example, in a gas turbine engine. The recuperator transfers some of the waste heat in the exhaust to the compressed air, thus preheating it before entering the combustion chamber. Many recuperators are designed as counter-flow heat exchangers. 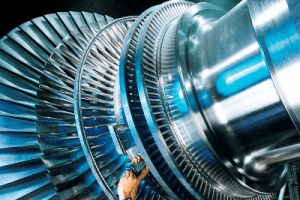 In steam turbines theory, significant increases in the thermal efficiency of steam turbine can be achieved through reducing the amount of fuel that must be added in the boiler. This can be done by transferring heat (e.g. partially expanded steam) from certain sections of the steam turbine, which is normally well above the ambient temperature, to the feedwater. This process is known as heat regeneration and a variety of heat regenerators can be used for this purpose. Sometimes engineers use the term economiser that are heat exchangers intended to reduce energy consumption, especially in case of preheating of a fluid.